With more rain in the forecast I chose to hike up the Kuli'ou'ou Ridge, one of the easier ridge hikes up to Ko'olau Summit. It starts in Kuli'ou'ou Valley, one of the eastern suburbs of Honolulu. The trail is only two miles in length, another 1/3mi longer if you go past the trail's end to Puu Okona. The trailhead is not as obvious as I thought. I turned Google Maps off once I got to Kuliouou Rd, thinking I'd find it at its upper end. I found what looked like a trailhead and even walked up the gated road about 50ft before I thought to check my electronics again. Turns out the TH is at the end of Kalaau Pl, a nearby sidestreet - doh! The ridge and valley trails use the same trailhead, splitting shortly up the trail. The ridge trail then begins a series of switchbacks, climbing about 700ft through forest in less than a mile. After reaching the ridge, the trail heads north, past an overlook bench and a shelter with picnic tables. The last half mile of the trail features a series of thigh-burning steps, rising in several series to the Ko'olau Summit. In wet conditions like I found today, the steps are pooled with water, muddy and not a little treacherous. The good news is the boards that form the steps have some sort of non-slip coating and I used these almost exclusively to avoid the mud and water. At the top there are signs imploring folks to turn around due to the dangerous cliffs that await just beyond. And they ARE a bit dangerous, too, but that didn't stop me (or the other folks I saw at the top later) from getting a look at the poor views to be had. 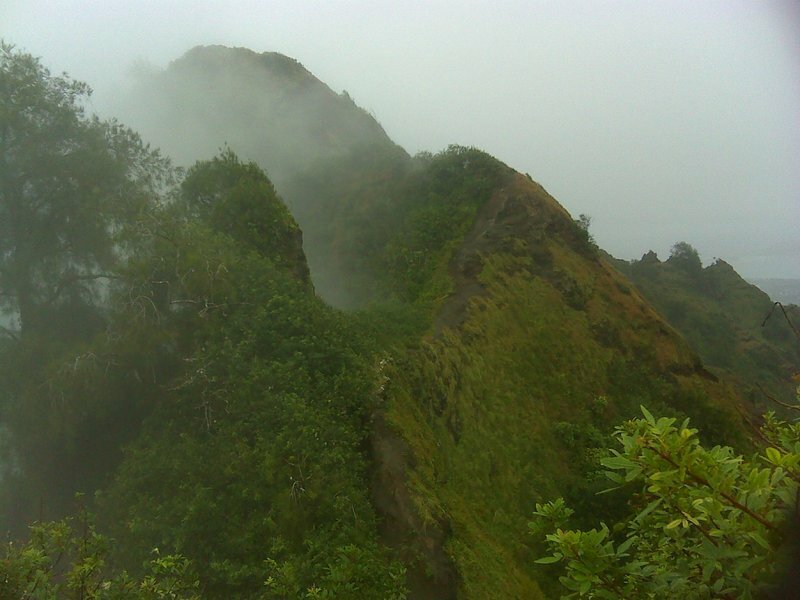 In keeping with the Ko'olau tradition, clouds sweep up and over the summit and make views rather scarce. At least it wasn't raining at the moment. The summit of Puu Okona could almost be seen to the north, 1/3mi away, for a fleeting moment before clouds occluded it once again. The Ko'olau Summit Trail that traverses the crest of the range is in pretty good shape for the hike over to the summit, not as overgrown as other sections I'd been on recently. But the exposure in places was quite extreme, an easy death fall off the east side only inches from parts of the trail. I went VERY slowly along the ridge with the wind blowing about 15mph with gusts somewhat higher. I found my way to the highpoint without finding much there of interest. In better conditions there's probably a nice view off the north side to Waimanola. I returned to the trail's end to find a guy using a selfie stick to take video of himself in the fog with no views. I wanted to ask what he could possibly do with such a video, but I didn't have a chance. He and his friend looked at me with my boots and pants painted in mud, rainjacket and gloves looking much the same, wondering where I'd come from. "Whoa, this dude just came up a different way. He must be a professional." I couldn't help but chuckle and didn't want to ruin the illusion by telling him I'd come up the same way as the two of them. On the way down, I found views opening up a little bit more but still not terribly clear. I came across quite a few other parties on their way up, most of them asking how much further they had to go. One group of 4 young African-Americans had hiked up less than half way and were surprised when I told them they still had a ways to go. Looking at my GPSr, I offered, "You haven't quite gone a mile yet and it's two miles to the summit." This didn't go over well with one of them in particular, (in a southern drawl) "What?! You mean to tell me that wasn't even a mile we done?" Guess I wasn't the bearer of happy news today. I finished up before noon and the was happy the rain held off the entire hike.